FROM BUSINESS TO BEING tells the story of three executives—a former investment banker at Lehman Brothers, a project manager in the automotive industry and a regional manager at the pharmacy chain "dm"—who embark on a quest to find ways out of the "rat race." Their motivation: the desire for more enthusiasm, meaning and authenticity in their work. Through their sensitive and yet forthright approach. 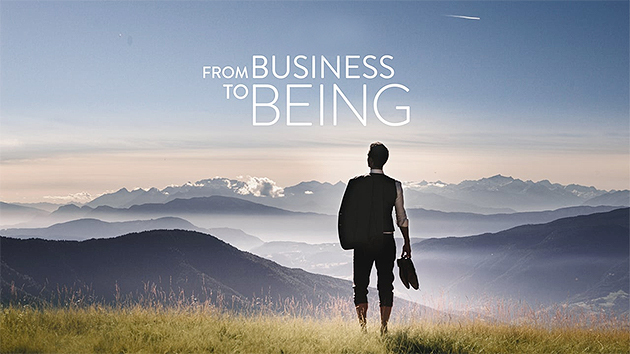 Hanna Henigin and Julian Wildgruber provide deep insight into the emotional sphere of the otherwise closed world of business leaders and explore the question: to what extent are the crises of today‘s workplaces crises of consciousness? Can meditation and awareness training help to free people from stress provoking patterns of thinking and behaving, and get back to themselves? What skills will be required from business leaders in the future and how do organisations in a globalised world have to be rethought and restructured towards more collaboration? Prof. Dr. Jon Kabat-Zinn, molecular biologist, meditation trainer, researcher and founder of the world famous "Mindfulness-Based Stress Reduction (MBSR)", which is an outpatient therapy for stress reduction in the form of an eight-week course. Prof. Dr. Arthur Zajonc, Emeritus quantum physicist and meditation practitioner for over 40 years. As President of the "Mind and Life Institute" he campaigns for a combination of modern sciences and spirituality in cooperation with the Dalai Lama. Prof. Dr. Tania Singer, neuroscientist, psychologist, and head of the department for social neurosciences at the Max-Planck-Institute for Human Cognitive and Brain Sciences. Based on the conviction that changes towards a better working environment and society are rooted in a growing awareness of the individual, FROM BUSINESS TO BEING is a film that touches people, inspires discussion and above all encourages an honest reflection to the age-old question: who am I? What inspires me? And how do I live and act accordingly?